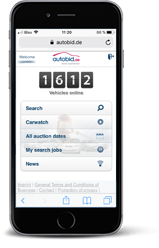 As a registered vehicle dealer, all the functions of the auction website are available to you with the new Autobid.de app even when you’re on the move. The innovative technology means you can monitor vehicle purchases and sales even better and more easily – any time and anywhere. Just like our website, you can also download our auctions with the new app in 22 languages and participate in all Autobid.de auctions – together with up to 25,000 trade vehicle dealers in Europe. The integrated bidding agent makes simultaneous bidding possible on several vehicles in various auctions. Vehicle dealers can benefit – even when they’re on the move – from the detailed vehicle search, the comprehensive vehicle details and the automatic synchronisation with “My Autobid.de”. After downloading the app and entering the login details, all the functions can be used immediately. Watch our video presenting the new app here. Autobid.de offers an optimised display of the website for Smartphones and tablets. With this mobile version you can log in with your existing Autobid.de access data as usual. Just like with your previous access to your PC, you will find all the vehicles you have viewed, the searches you have set up, submitted bids etc. A bidding function is also integrated here, just like in the Autobid.de app. An overview of the vehicles delivered is also available for suppliers together with our Mobiltax assessment system. In addition, there is a News area with a RSS-feed on GW trends and the usual multiple languages from Autobid.de. As soon as you download our website www.autobid.de with a mobile device, the device automatically recognises the mobile version and directs you there. If you don’t want to use this function, you can switch to the traditional display.